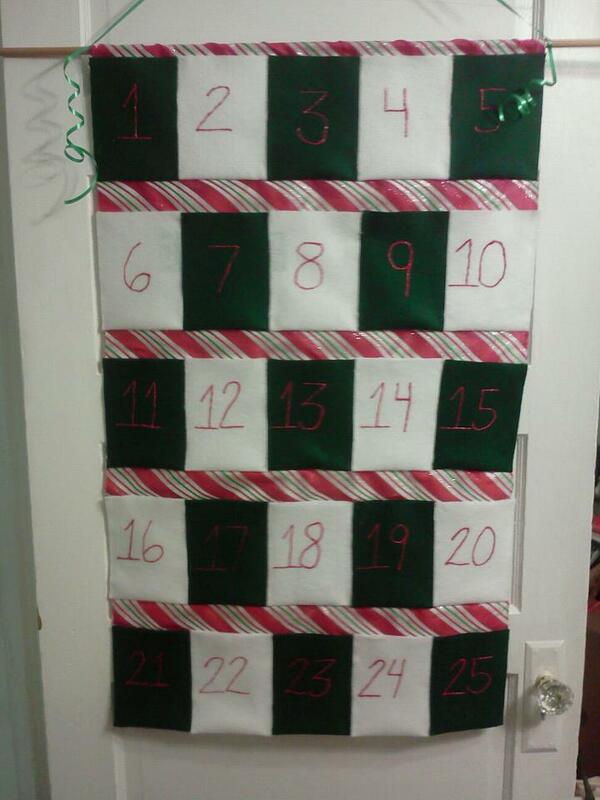 When my sister and I were growing up, we loved taking turns each day opening up a little door on our family Advent calendar. We started opening the doors one day at a time from December 1st until Christmas Day. Behind each little door awaited a sweet surprise... usually a piece of chocolate or candy. My mom is making my family a beautiful quilted advent calendar, but until that one is finished, I wanted to have one that we could use with Balian. I know he's still too young to understand what advent is all about, but that never stops me from telling him about Jesus and His love. So, this Christmas, we'll be reading stories about the birth of baby Jesus, the shepherd boy, the angels and we'll be starting our own advent calendar tradition. Advent calendars are almost hard to find these days. I didn't want a wooden one with the little tiny boxes, and I don't want a paper one with chocolate candies, because Balian is too young for those. 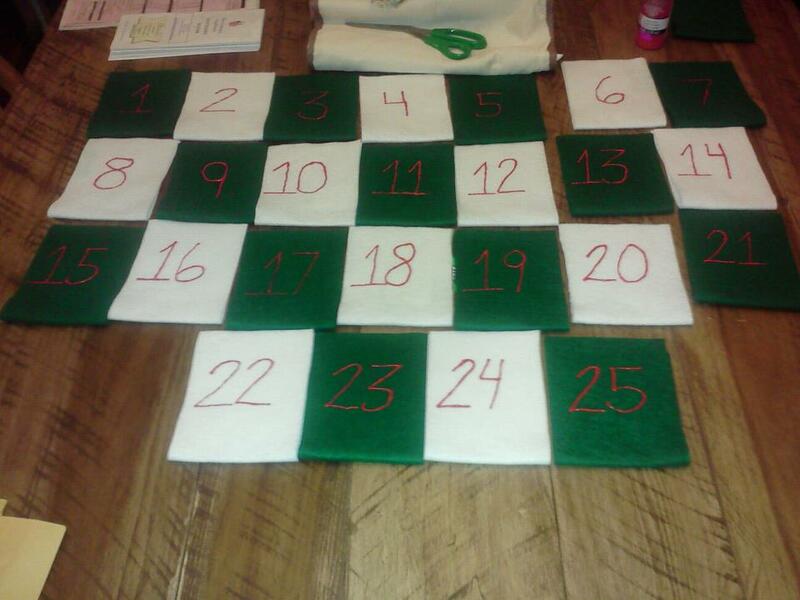 So, I just decided to get crafty and make my own advent calendar this year. It was super easy, cost less than $5.00, and you can make one, too! 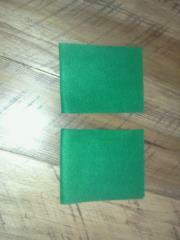 I went to a craft store and bought 13 pieces of felt- 6 white and 7 green. I bought a red fabric paint bottle and used my own ribbon, glue gun (and glue sticks) and a wooden rod. I folded each piece of felt in half (long ways), and then cut it up the middle, making two pockets out of each piece of felt. I glued the outside edges together, and let them dry. I ended up with 26 pockets- only need 25. I alternated the colors green, white, green, white, etc... and laid the pockets out 5x5. Next, I numbered each pocket with the red fabric paint 1-25. Now, If I'd had lots of extra time, I would have sewn the pockets together, but I just used my glue gun. I glued 1-5 together, side by side, to make one, long row. Repeat that process with 6-10, 11-15, 16-20, 21-25. After the rows were complete. Once the strips were dry, I turned them over and added a festive wide wired ribbon strip in between the rows of pockets. Tip- start at the bottom of the first row and just glue down the top of the ribbon, then glue the bottom of the ribbon to the top of the next row. I added one last strip of ribbon to the top, folded it over and made a little slit for the wooden rod to sit in. I put the rod in, and then added green curling ribbon to hang it with. We have lots of pockets to stuff with little treats like mittens, a new bath toy, snacks, maybe a new little car, etc. So, Balian will get to pick his treat every 3 days. Mommy and daddy get to take turns, too! If you don't have an advent calendar, you can make one like this super quick and start your advent calendar tradition with your kids today! May this advent season bring you peace and joy! Super cute!! Look out Martha Stewart! This is such a cute idea-I'd love to do it with my kidlet! I wonder how hard it would be to make molded chocolates like the Advent calendars you buy in stores.